Unsung heroes in the world of heavy metal, OMEN have been around for more than 30 years, and are still beholders of the flame, playing live and releasing albums to this day. Now, their first three albums - Battle Cry (1984), Warning Of Danger (1985), The Curse (1986) - are finally being re-issued for fans, and available as both digipak CDs (for the first time!) and LPs. The digipak CDs for Battle Cry and Warning Of Danger will feature bonus tracks, while The Curse digipak CD will have the entire Nightmares EP (originally released in 1987) as a bonus; all three albums include 18-page poster booklets. 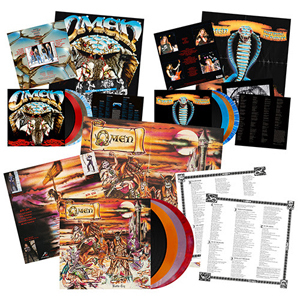 The vinyl editions are part of the Metal Blade Records "Originals-Series", with 400g heavy cardboard spine sleeves (inside out print), 60x60cm two-sided artwork posters and 250g inserts.